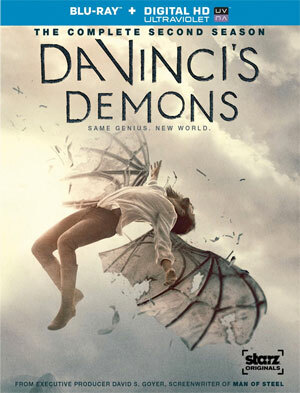 Anchor Bay Entertainment has just announced the upcoming release of Da Vinci’s Demons: The Complete Second Season, scheduling a Blu-Ray Disc and a DVD version for March. “Da Vinci’s Demons: The Complete Second Season” begins as Florence is thrown into chaos in the wake of the Pazzi conspiracy and Leonardo da Vinci must push the limits of his mind and body to defend the city against the forces of Rome. When the dust settles, friends are buried and rivalries enflamed. While the Medicis go to unthinkable lengths to deal with new threats, da Vinci continues on his quest to find the fabled Book of Leaves and uncover the secret history of his mother. He’ll come to realize that he has lethal competition in his quest—new enemies who may be even worse than the forces of Pope Sixtus. The 3-disc release will not only contain all the episodes, but also a number of bonus features, such as a look at the New Sets and the Featurette ”Creating the World”. ”A Closer Look” will give you a behind the scenes look, while The Journey Begins: Season 1 Recap will remind you of the events that happened in the show’s previous season. “Da Vinci’s Demons: The Complete Second Season” will arrive in stores on March 3 for $54.99 on Blu-Ray Disc and $44.98 on DVD.